When moving your belongings, you are sure to run into some particularly heavy objects. After wondering, “How did we get this in here in the first place?” it’s time to carefully move it again – without injuring yourself. 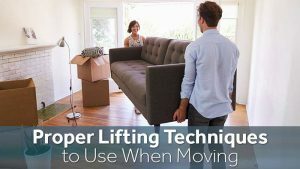 Here are the top techniques to keep in mind when the time comes to move large objects into storage or moving spaces. When possible, get some help with your grip, including straps, work gloves, and other accessories to increase your grip strength and improve safety. Test grip locations carefully to make sure they are sturdy enough to support lifting, and won’t hurt your hands at the same time. When lifting heavy objects, it’s important to have a strong base to start from – otherwise you risk many different types of injuries. Plant your feet firmly and keep them around parallel with your shoulders before you lift. Make sure your shoes have good traction! You have probably the old advice to lift with your legs and not your back. That’s mostly true — lift with your legs, glutes and core. Keep your back straight, pull your shoulders back, and try not to twist your head or neck when you are lifting. This will help keep your spine safe when dealing with some of those heavier objects. As a general rule, if something is tough to lift then you shouldn’t lift it past your waist. Not only does this drastically raise the chances that you may topple off balance, but it also lifts the object past where your core and legs can safely manage it, increasing the odds of a serious back injury. Keep the object you are moving around waist height. If it goes above your belly button, be extra careful. This is sometimes a problem with awkwardly-shape objects. Keep the center mass as close to your center of mass as possible. Otherwise, you may not have enough strength to move it and your shoulders will suffer. If you have to turn while you are moving a heavy object, then shuffle your feet carefully while keeping your spine straight. 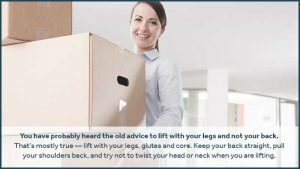 Twisting your spine while carrying something heavy is a recipe for trouble, even if you are only moving it a short distance to your Zippy Shell. The moving project always goes better with a little help! Heavy objects are far safer if you have two people working on them, and you also have someone nearby to help in case anyone gets hurt. It’s just a good idea to have a pair of helping hands along. If you face the stress of moving heavy objects in your next big move, make things easy on yourself and contact Zippy Shell Greater Columbus. Here’s how to get free quotes for both moving and storage!